Nowadays USB interface for charging is common among all the electronics gadgets. It used to provide connectivity for synchronization but now it is capable of providing stable 5V voltage for charging at the same time. 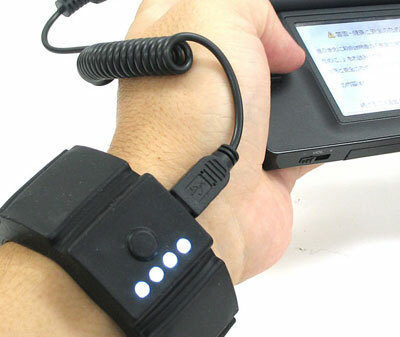 Thanko, a Japanese famous online shop has came out with the idea of integrating a small Lithium-Ion battery into a bracelet that provides voltage source to charge portable devices inclusive of PSP (Playstation Portable), DS Lite, mobile phones and almost every devices that came with compatible USB interface. Unlike other portable charging, the idea came out to be quite useful since the bracelet is very lightweight and wearable most of the time. Weighted at only 80 gram with dimension of 26 cm X 3.5 cm X 1.2 cm, it is equipped with a 1500 mAH high capacity Lithium Ion cell for backup charging. The user just needs to connect the charging cable to the device and it is ready to be used. No pricing has been announced yet. But if the manufacturer can combine this innovative idea with existing products such as watch or other fancy functions, it will be more value added and attractive to end consumers.